(Model Number: MF232W. Paper Feeder: Cassette. Get started. Expert Service. Unbeatable Price. Owner's manual. Power cable. See mfg. for info on print speeds.). 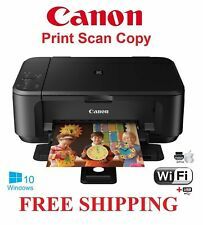 Canon Pixma MG2522 All-In-One Inkjet Printer, Scanner & Copier With No Ink! THIS PRINTER DOES NOT HAVE WIRELESS CONECTIVITY. Model number L100. Printer Language UFR II LT (Host-based. Fax Resolution Up to 200 x 400 dpi (super fine. pC Fax TX only. Print Speed Up to 19 ppm (letter. Print Resolution Up to 600 x 400 dpi (1200 x 600 dpi quality. ). Stylish & compact. Canon 1368C002. Enhanced connectivity. Enjoy the simplicity of connecting your smartphone, tablet and all your favorite devices with ease. (This all-in-one printer lets you manage scan, copy and print jobs via built-in Wi-Fi to reduce reliance on cords. Reload less often with two 250-sheet trays. See mfg. for info on print speeds.). 500-sheet paper trays capacity 3" LCD touch screen. The imageCLASS MF236n has print, scan, copy and fax capabilities so you can accomplish all necessary tasks with just one machine. imageCLASS MF236n. imageCLASS MF236n Black and White laser. Multifunction Devices: Copier/Fax/Printer/Scanner. (Reload less often with the 250-sheet input tray. Get started. for info on print speeds.). Toner (powder) is used instead of ink, so you get smudge-free images and text. Paper Feeder: Cassette. Printer Connectivity: Apple AirPrint, Google Cloud Print, Mopria Print Service. The Pixma MP530 Office All-In-One makes any task easy. Canon FINE (Full-lithography inkjet Nozzle Engineering). Canon Bubble Jet Direct, Canon Direct Print, PictBridge. Canon FINE (Full-lithography inkjet Nozzle Engineering)Copier. We are always more than happy to help or make any issue correct. 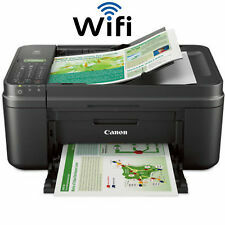 Canon PIXMA G3200 Wireless All-In-One Printer. Its reservoir system holds enough ink to print 6,000 black pages and 7,000 color pages, and it connects to your devices wirelessly, so you can print from anywhere. It shows normal wear from used. Overall it is in good condition. It is used, tested and fully functional. Trending at $383.31eBay determines this price through a machine learned model of the product's sale prices within the last 90 days. With Wi-Fi(1), Bluetooth(2), Ethernet and even Cloud(3) capabilities, you can conveniently print from all your favorite devices. The premium results you want, in the size you need. -PIXMA TS9120 Wireless Inkjet All-In-One Printer. In 1992, Canon released the CJ-10, the world's first digital all-in-one printer, scanner, and full-color copier. This technological advancement allowed the public the option of having fewer devices while completing the same number of tasks, such as sending faxes, copying documents, or scanning forms. Updated all-in-one printers provide the same opportunity, and offer even more features than before. What are the types of Canon all-in-one printers? Inkjet: This is a printer in which the characters are formed by small jets of ink. The advantages of inkjet printers are their modest desktop footprint and lightweight feel. Some models are lightweight and transportable, which means they can be transported in and out of the office as needed. Laser: This type of personal computer printer uses nonimpact, photocopier printing technology. These printers are designed for high-volume printing needs and typically require few refills. 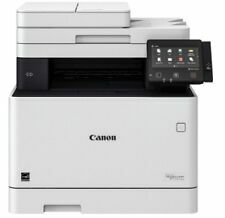 What are the models of the Canon all-in-one printers? PIXMA TR8520 Wireless: This model features a 4.3-inch touchscreen LCD display, and up to 4800x1200 dots per inch (dpi) print resolution. It also includes faxing, printing, and scanning capabilities at 1200x2400 dpi. PIXMA TS5120 Black Wireless: This Canon printer offers a 2.5-inch touchscreen LCD display, up to 2400x1200 dpi, and includes scanning capabilities at 1200x2400 dpi. PIXMA TS6020 White Wireless: These printers have a 3-inch touchscreen LCD display and include scanning capabilities at 1200x2400 dpi. PIXMA TS8020 Black Wireless: This model has a 4.3-inch touchscreen LCD display. It also includes scanning, faxing, and copying capabilities at a higher 2400x4800 dpi. Image Class LBP214dw: This high-level model is a wireless, mobile, ready laser printer. The device prints in color and in black and white. It features up to 30 pages-per-minute print speed, with a paper cassette capacity of 250 sheets standard cassette. However, it does not have faxing capabilities. What are some features of the Canon all-in-one printers? These printers come with a range of features, from scanners to Bluetooth. Scanner: This compartment scans documents and converts them into digital data that can be shared via the internet or printed as a hard copy easily. Wi-Fi: This allows the printer to connect to any local wireless networks, whether that means an in-home network or mobile hotspot. Bluetooth: This wireless feature allows the printer to connect to any Bluetooth-enabled device within 30 feet of the machine. This is beneficial when sending items from a mobile device or laptop without Wi-Fi capabilities.